It’s a magical time of year. The weather’s changing, and this Saturday brings one of Midtown’s most insane days back to the bottom park in Cloverdale-Idlewild. 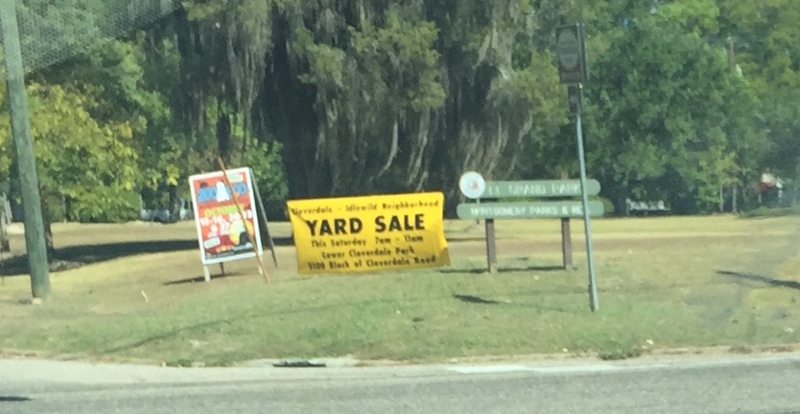 It’s yard sale time! Every year, our neighborhood association hosts a massive yard sale filled with items ranging from the bizarre to the useful — mostly at incredibly low prices. Although we never quite know what will be for sale until we unpack before sunrise on Saturday morning, this year we’re happy to bring a preview of some of the goodies. All day today, our intrepid neighborhood association leaders have been cruising around town in a giant rental truck picking up donations. When they stopped by our house this morning to pick up our offerings (a baker’s rack, two bookshelves, and two gorgeous vintage flokati rugs), I got a peek inside. Already, they had a working elliptical trainer and a super cool bookshelf from our beloved and departed Capitol Book and News. I’ve been told that there will be many tables, chairs and bookcases on offer, as well as some leather furniture – pictured below. Also, as always, there will be an astonishing amount of clothing, including childrens’ clothing that you can buy by the sack. The truck, with stops yet to go! Please come and see us. We start at 7. Please don’t come and be that weirdo stalking the sale beforehand, as we need the time to set up. And do say hi at the cash box – I’ll be staffing it as always, and will be happy to make good deals for MML readers!